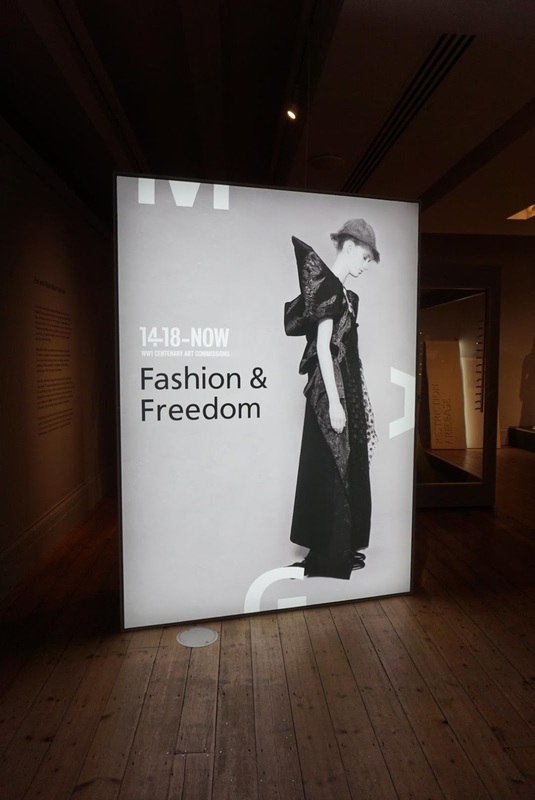 Following on from a fantastic evening of events, it was time to find out more about the Fashion & Freedom exhibition. 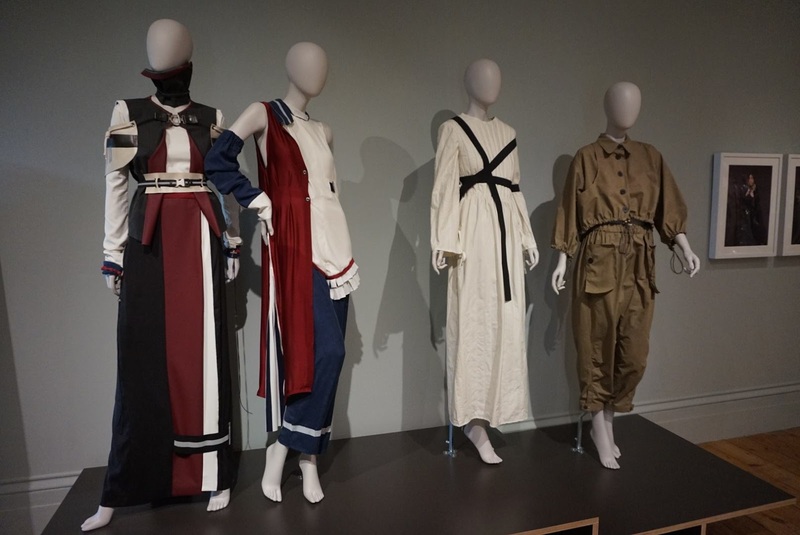 If you haven’t had chance to read my previous blog post, then Fashion and Freedom is part of 14-18 NOW a five year programme of events that aim to get us involved with the centenary of the First World War and bring us closer to the people and events that took place and impacted on the way we all live now. This particular exhibition looks at how fashion evolved before, during and after WW1, something I’d never had the chance to think about before. Although a big fan of history, especially the history of fashion, I’d never looked into the early 20th century before. I’d obviously known about the revolutionary flapper girls, and the even the social strategies that got women out of the house wife roll and into men’s work during WW2. But WW1 had never caught my interest. Well I can honestly say, after the two days of events, I’ve never felt more inspired by an era of British history. Not only by the brave soldiers that fought for our freedom so bravely and at such a young age, but by the women that stayed behind and kept the county afloat in an age where we couldn’t even vote. 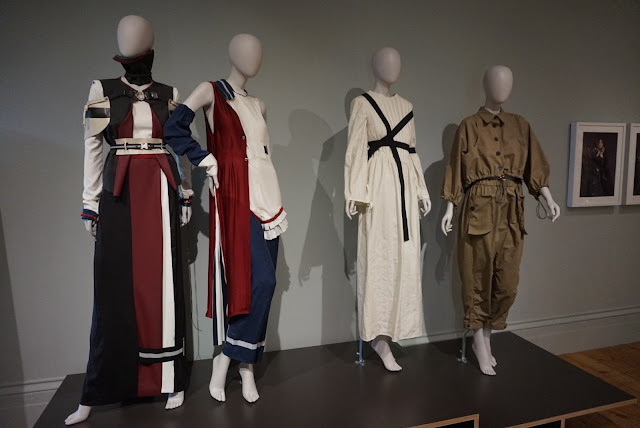 14-18 NOW commissioned 6 designers (Holly Fulton, J JS Lee, Roksanda, Vivienne Westwood, Emilia Wickstead and Sadie Williams) to create looks inspired by the women of the First World War. Based at the Manchester Art Gallery; you see these stunning pieces as soon as you walk into the exhibition room. Each outfit is breathtaking beautiful, and for me, the beauty of the clothing was discovering what inspiration the designers had drawn on for their particular piece, as you couldn’t immediately tell. My favourite has to be J JS Lee’s stunning look. 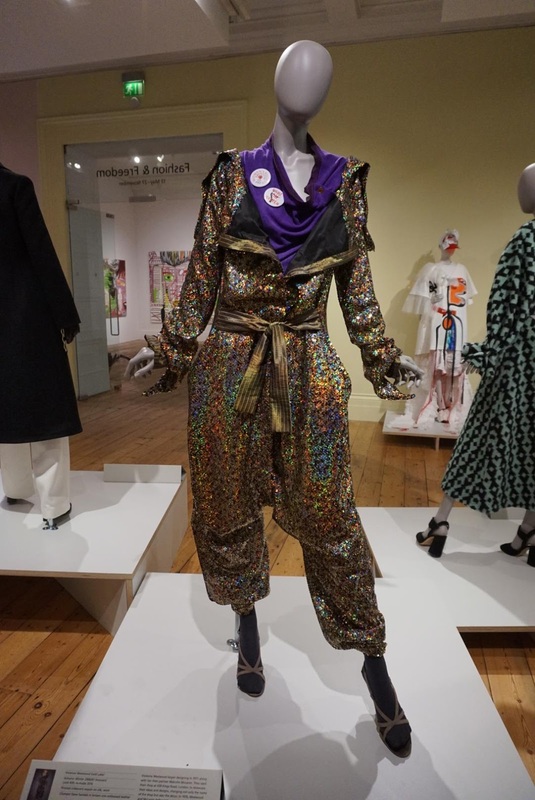 She was inspired by the end of war and how women had transitioned from long restrictive into more male forms such as trousers. She references this by adding leg warmers under the skirt in her design. She kept a neutral palette and concentrated on recycled textures. As well as the designer pieces, 14-18 NOW also worked with 5 Universities to create the Restriction/Release collection (Leeds College of Art, London College of Fashion, Manchester School of Art, the University of Salford and the University of Westminster). This collaboration aimed to showcase up and coming talent as well as highlighting the social changes that took place during WW1. Some of the designers used the abolishment of the physically restrictive corsetry that women wore before the war and “broke free” from due to the new roles that were forced upon them. 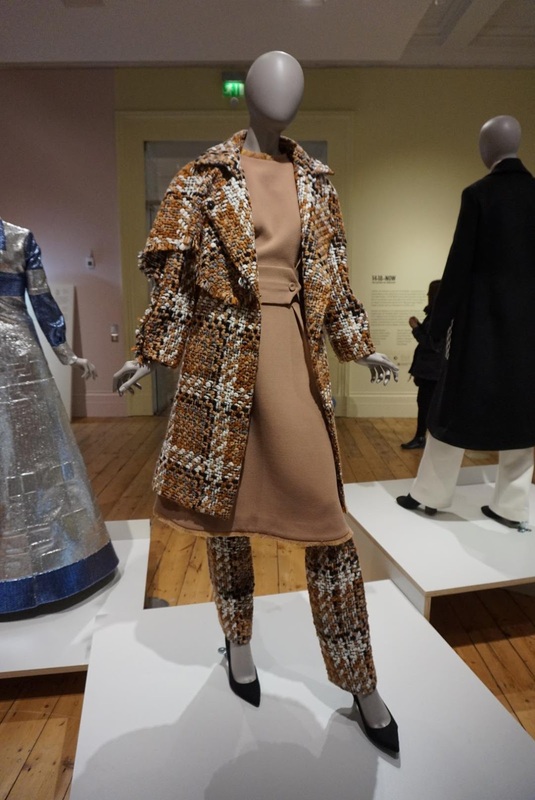 They incorporated them in to their designs to show it wasn’t just metaphorical restriction that existed at the time, but every day garments made life difficult for all women, whatever their social status. The uniform in the film was designed by Manchester brand, Private White VC who were named after WW1 hero, Private Jack White. Much of their collection has a nod to military, so they were the perfect match to get involved on the project. 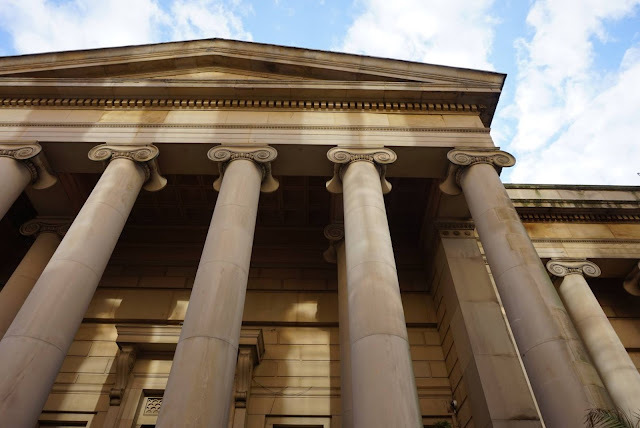 The other 3 films are being shown at the Manchester Art Gallery, and are equally as fascinating and incredibly moving. My favourite has to be the film by Show Studio, directed by Rei Nadal which shows the freeing of women wearing corsets. 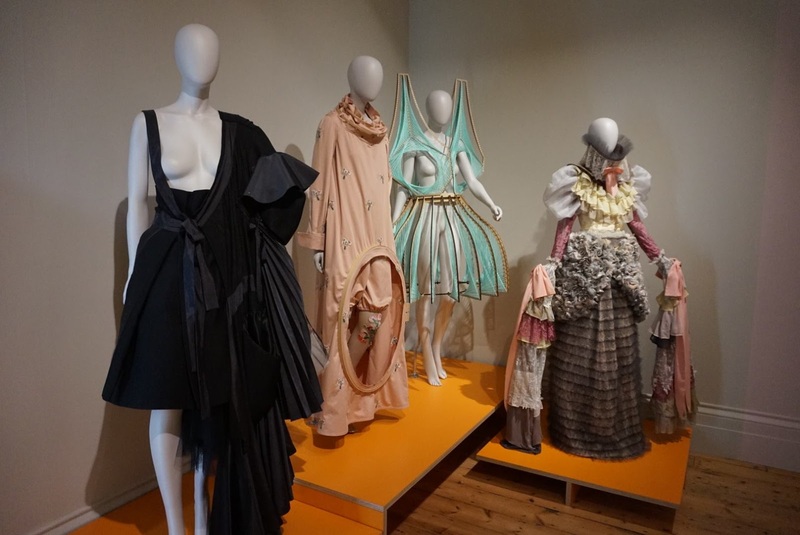 Having touched upon this theme in both the designer and student pieces, it was wonderful to see how this translated to film. You can watch all of the films here. 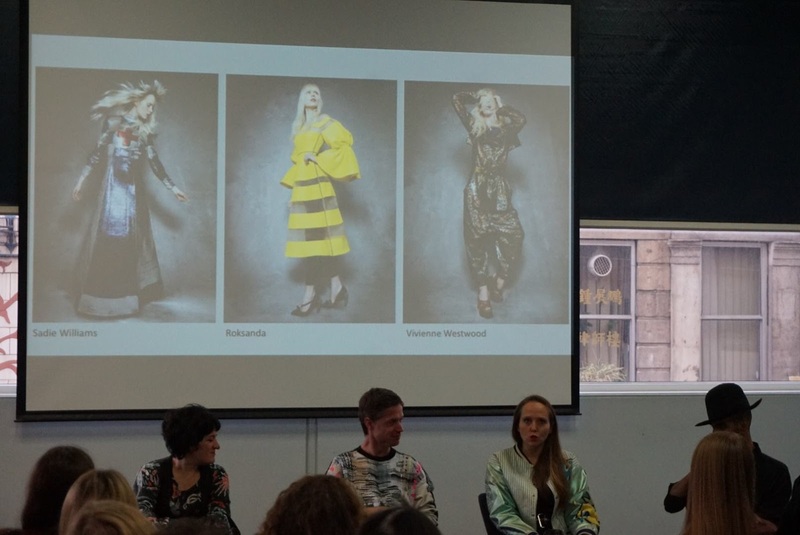 The final event that I attended was the one day ‘Fashion is Work’ symposium which was again held at the gallery. The focus of the day stemmed from the Fashion & Freedom exhibition, and made a great talking point. 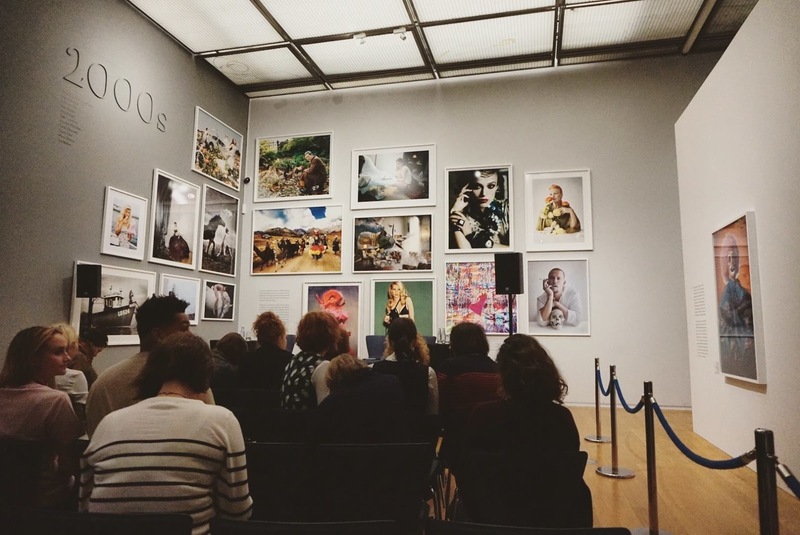 The day was filled with talks from experts in the industry, from Caroline Rush, the Head of the British Fashion Council, to photographers and stylists (Jez Tozer and Kim Howells). The day was hosted by Darrell Vydelingum, Jenna Rossi-Camus and Senior Curator at the gallery, Natasha Howes. It was an incredible day, and such a valuable experience, especially for people who want to get into the fashion industry. Hearing from the exhibitions designers was truly insightful, I loved finding out the inspiration for each piece, and in turn, how the project had inspired them and their work continuing after their initial involvements. Like many, WW1 wasn’t something they knew a lot about, so when asked to look at it from the angle of the women, many found it an empowering subject. I’d like to thank the team at 14-18 Now for inviting me to take part in such an education and inspiration few days of events. I have a new passion for history and women’s rights and have even gone on to do my own research about women and WW1. If you’re in town and can spare 20 minutes, I definitely recommend you go and see the exhibition which is on until the 27th November. Let me know if you do go, I would love to hear your thoughts! I’ve loved history since I was a little girl. I’ve just always found it absolutely fascinating. I will watch every period drama, visit as many National Trust properties as I can and I genuinely love reading a good historical novel. To me, the past is as important as today. Everything we’ve done as a human race, has resulted in our society as it is right now. I’ve always looked at history through rose tinted glasses; with stories from castles and grand stately homes - tales of love and adventure. It’s only now, as I get older, that I am more interested in the real people of the past. Their lives and struggles and how they’ve changed the way we think. I am particularly interested in the history of women’s right. We all know about the suffragettes, but have we ever thought about what an incredibly massive task they undertook just so we had the same rights as a man? I would happily describe myself as a feminist. - the advocacy of women's rights on the ground of the equality of the sexes. Feminism is about equality; we want equality for everyone; men, women, black, white, rich, poor, Muslim, Christian; everyone. But this is not an easy concept for the world to take on. Women of all races, colours and religions have had an incredibly interesting past. 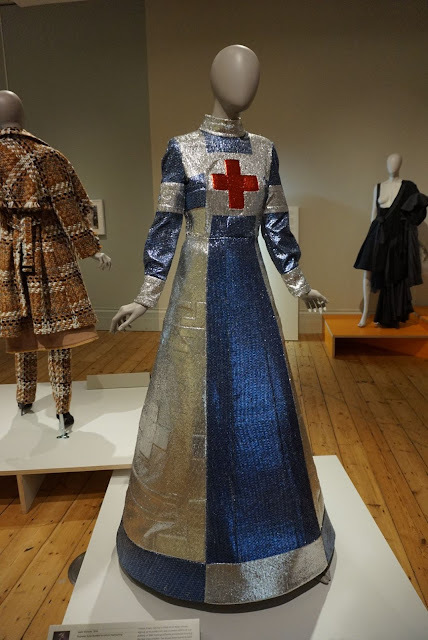 I started to look into this when I was asked by 14-18NOW to attend a series of events that celebrate the evolution of fashion in the context of the centenary of WW1. If you’ve not heard of 14-18 NOW, you will have heard of their work. They are touring the breathtaking poppy installation at the Tower Of London and they commissioned the hauntingly beautiful “ghost soldiers” that were seen all over the UK. From 2014 until 2018 they will be creating experiences that bring us all closer to the events that happened 100 years ago and how they still have an impact on our lives today. For me, what stands out is the overwhelming change that the role of the woman went through. The events that 14-18 NOW invited me to attend, were held at the Manchester Art Gallery and focused on the Fashion And Freedom exhibition, which explore the notion of women and how we were essential ‘freed’ from some of the social constrictions before, during and after WW1. I think I’ve taken for granted the fact I’ve had a relatively ‘gender neutral’ upbringing. I was an only child until the age of 10 and I never felt that being a girl changed any aspect of my life. I was a tomboy, yet still had dolls and barbies and the concept of only playing with things that were meant for girls, never entered my head; I played with toys I liked, wore clothes I chose and never felt constrained in any way. My parents both brought me up to believe that I could be whoever I wanted to be. It honestly never crossed my mind that fact I may be judged just because of my gender. Naively I continued to feel this way throughout my teenage years, despite choosing to study, what some people would say is a stereotypical female topic; fashion and textiles. However this opinion of equality has dramatically changed since starting blogging and working in fashion. I’ve definitely felt the prejudice that comes with being a women, and I even find myself slightly embarrassed when I tell people what I do for a living, worried in case they’ll judge me and presume that because I enjoy fashion and clothes, I couldn’t possibly have an interest in politics, economics and history (which I do, big style!). I have found myself repeatedly defending our industry, highlighting the fact that fashion and what we wear, plays a big role in not only our society, but also our place in the world. Like it or not, our clothes define who we are. We choose what to wear, and we have to wear clothes every day. Some people argue they “don’t care” what they wear, but even that statement will be reflected in the clothes they choose every morning. We constantly judge each other on appearances, whether bad or good, it’s human nature and it’s never been more so, especially in today’s society of social media and the constant scrutiny we appear to put on one another. Teresa May is a powerful woman. She runs our country and is one of the most influential female powers some would say, in the world. The fact she is constantly in the spotlight, has to me highlighted the complete inequality of our media today. Almost every day, I read an article about what Mrs May was wearing. Her fabulous collection of shoes and handbags have become a constant point of reference, despite her talking about immigration, the conflict in Syria, or the general state of our country, her fashion sense is seen as more interesting. Did David Cameron get as much coverage for his tailored, Italian suits? No. I don’t think I’ve read one article about what Mr Cameron wore. It’s then I realise how unequal or society still is, even in 2016. Women are still not seen as equal to their male counterparts. I’ve discussed these frustrations with other, powerful women in our industry, and they seem to feel the same frustration. We can earn money, be intelligent, interesting and feminine, yet we will still be viewed differently. The first event that I attended was the “Women in Work” panel which was a debate and interactive discussion which was held in the beautiful surrounding of the Vogue100 exhibition at Manchester Art Gallery (which ends 30th October so get down there quick if you want to see it! ), with some of the most powerful and influential women in fashion today; Alex Shulman - Editor Of British Vogue, Jo Ellison - Fashion Editor at the Financial Times, Isabella Burley - Editor in Chief at Dazed Mag and Caroline Rush head of the British Fashion Council. The discussions were focused on how women are perceived in the work place, with all of the panel agreeing that we still face many discriminations, including being judged by what we wear not who we are nd how men can sometimes have an unfair view of our capability. However, both Jo Ellison and Isabella Burley agreed that a lot of men are fully supportive and had in fact given both of the the opportunity to be in the roles they have today. They also discussed the role of the ‘mother’ in the work place and how maternity leave can be detrimental to both mother and work place, with small businesses losing out if they employed young women. It was an interesting point, especially from the business side of things. I think the Government should really be helping both sides, so that women can feel supported at one of the most important times in their lives. It was fascinating to hear how these inspirational women ended up where they are today, sometimes despite sexism, and the much talked about ‘glass ceiling’. After the panel discussion, I headed over to Selfridges where I was lucky enough to hear Jo Ellison Interview Alex Shulman in an intimate setting. She is truly my inspiration. 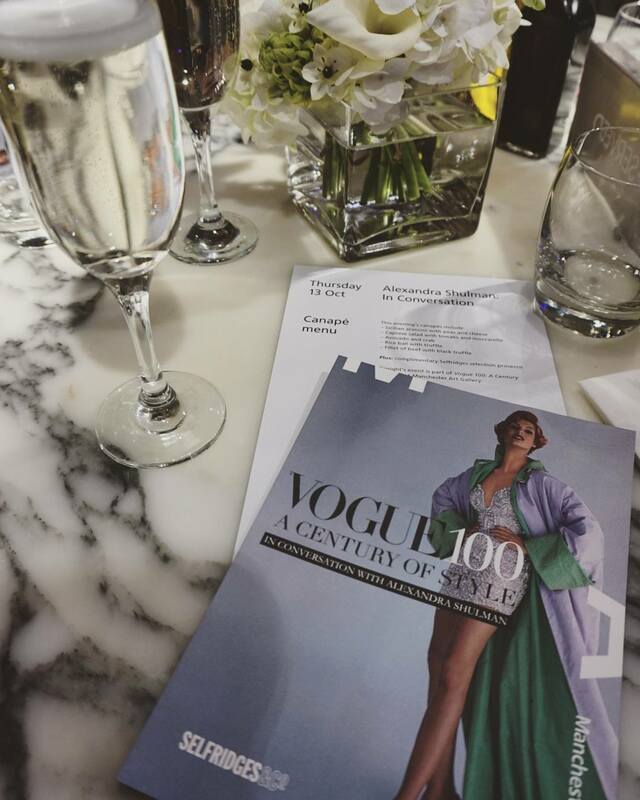 Vogue in general has helped me through so many tough times. Reading the cultural, feminist based articles and not just looking at the fabulous clothes, I felt the energy and focus to try hard to get into the industry that I love so much. Alex also discussed the recent ‘real women’ issue, which featured no 'typical' fashion models, only inspirational women with fantastic stories to tell. Alex has spoken many times about the equality within the fashion industry, especially regarding body image and how so many designers just do not cater for women with a “normal” body shape. I got to speak to Alex and Jo after the interview and they are both genuinely lovely. 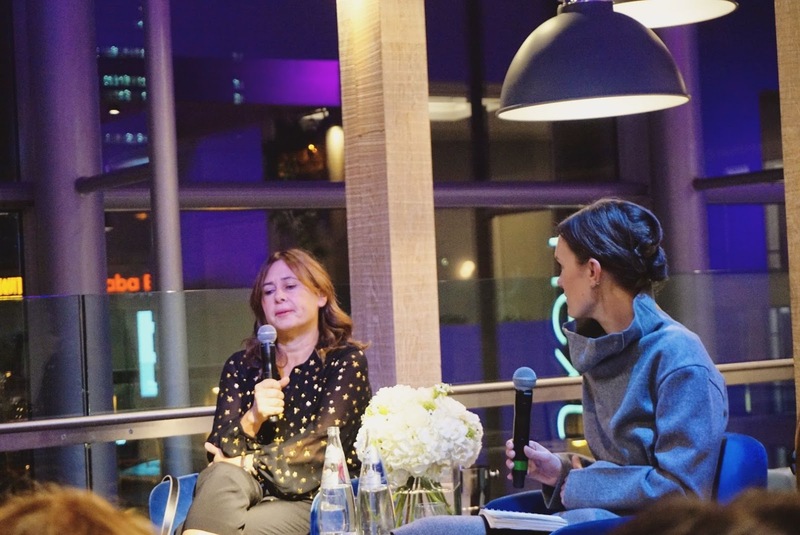 They asked about my blog, and we discussed how bloggers have had an impact on the fashion industry. 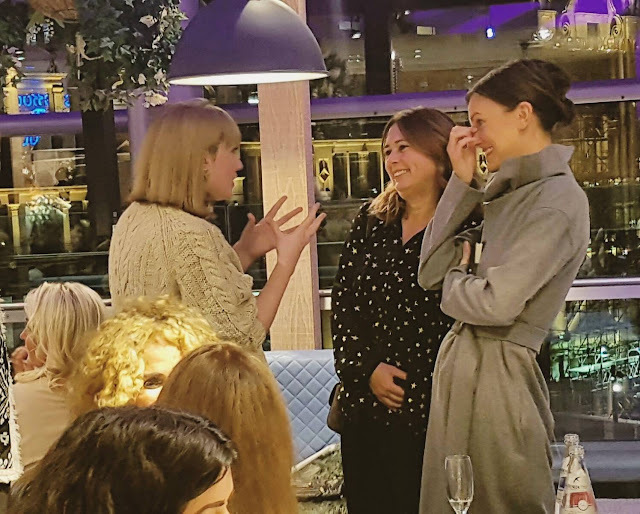 It was such a fantastic evening of women supporting women and learning about how much the industry has changed over the years. 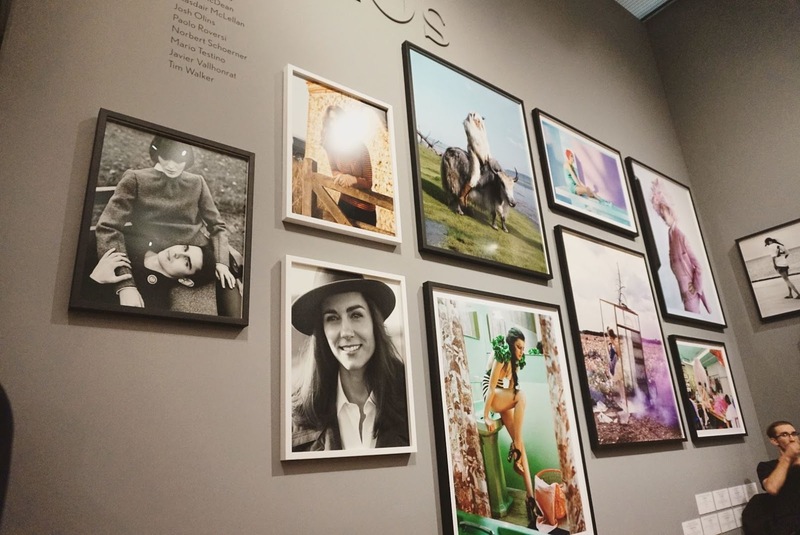 It was not only thought provoking, but it also made me prouder than ever to be a woman working in fashion.